We had hoped to get an early morning start and beat the rain, but when Phil’s alarm clock went off at 6:30 I could hear it downpouring. Michael had left even earlier, at 5am, so we ended up sleeping in until 8 or so. It rained on and off throughout the day, but it was never too unpleasant. We stopped around 11 for food, at a place called European Deli that was clearly Polish. One highlight of the ride was when a woman started cheering for us from her vehicle, using an orange cone as a megaphone. Penny rode alongside Phil for a bit, and he shared our website with her. Cheering is always wonderful motivation, so we appreciate the support! The worst of the rain happened after we made it into the city, and immediately after Phil changed his socks, since the sun had finally come out. We were on a path along the river, and the wind was pretty strong. I wanted to take a photo of the sky, but then it started raining heavily, so we found shelter under a bridge for a few minutes until we thought it had passed. At least it wasn’t cold. A few miles from our destination, a guy rode by on a touring bike with a For Sale sign on the back panniers. I asked him how much he was asking for it, and he said that he had bought it new only two weeks ago for $2000 and ridden it from Toronto to Manhattan. He was asking $1000. I am considering it, since the bike I have is not designed for touring, but the frame might be too large. My first fall of the trip happened when we were heading for the Queensborough Bridge on York Ave. I was riding behind Phil and looked down at Garmin to see where to turn, when Phil stopped and I crashed into him, knocking off one of his panniers and falling over. Fortunately, both of us and our bikes were fine. We arrived at Rym and Emily’s apartment in Queens around 5pm, and waited in the lobby for Rym to get home. After Phil and I had each showered and Emily came home, we went into Manhattan to have dinner with 6 of their friends at a Korean restaurant. The food was incredible. We are spending the weekend in NYC, so I will be seeing family and friends (and running) over the next two days before moving on south. 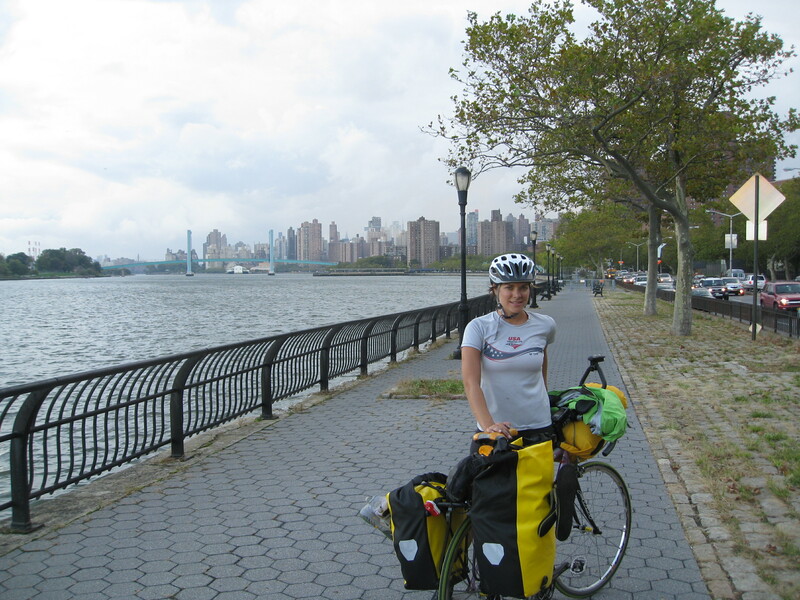 Posted on 14 October 2011, in Bicycle Touring, Providence to New Orleans. Bookmark the permalink. Leave a comment.